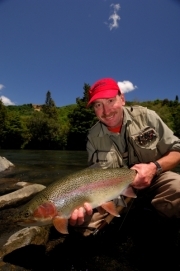 Tongariro Lodge was established in 1982 by legendary angler and guide Tony Hayes. It has earned an excellent reputation for gourmet dining, the finest accommodation, quality outdoor activities and the most experienced fly fishing guides in New Zealand. The lodge is located in beautiful grounds on the banks of the legendary Tongariro River on the southern shores of Lake Taupo on New Zealand’s North Island. Tongariro Lodge guides provide access to over 40 rivers and three lakes and can offer an incredibly diverse range of rainbow and brown trout fly fishing. 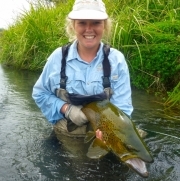 Every year, trout over 10lbs are landed by Tongariro Lodge guests with the average fish being around 4lbs. The Tongariro River is one of the most famous rivers in New Zealand. Every year over 50,000 prime-conditioned trout migrate up the river from Lake Taupo providing truly amazing year-round fishing. Through the experience of the guiding teams, special access to many rivers that run through private land has been acquired. It is a truly vast fishery that can provide the trout fishing experience of a lifetime year round to beginners and experts alike. The lodge has its own rafts, four wheel drive vehicles and boats and as an option some people treat themselves to a helicopter flyout. There are three choices of accommodation at Tongariro Lodge. One-bedroom chalets, two to five-bedroom villas and executive villas. All are exceptionally comfortable and are well appointed. The heart of the lodge is the main building with its rustic lounges, comfortable sofas, open fires and trophies of the past adorning the walls. Dinner is taken in one of the two dining rooms and the cuisine includes the best of New Zealand game and traditional foods. The lodge serves a hearty breakfast and provides special hamper lunches for you when out fishing. The lodge offers an all-weather tennis court and a secluded spa pool, helipad and free wireless internet. Some of the best fishing on the North Island. Land packages are from £1,300 for a 4-night stay.